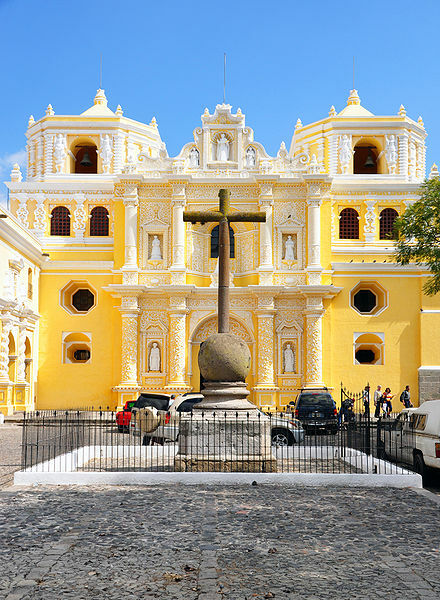 The colonial city of Antigua was once one of the most magnificent locations in Central America. 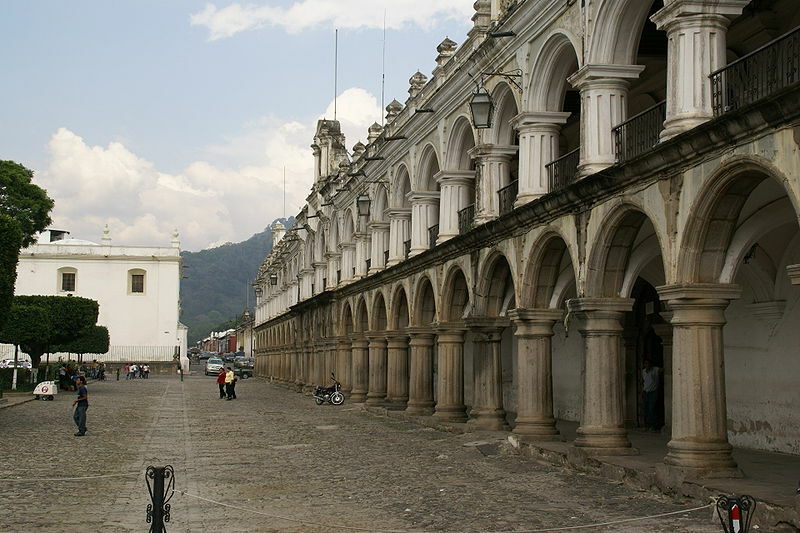 Located about 30 miles west of Guatemala City, it was established as the capital in 1541. 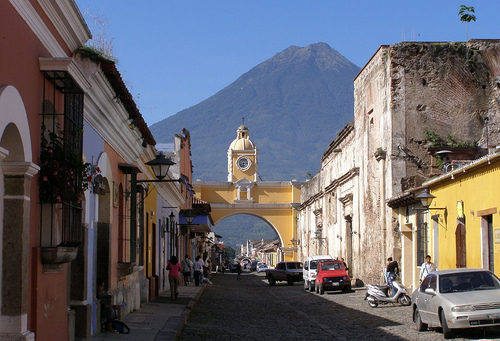 After the second of two devastating earthquakes in the 1700s, the government ordered that the capital be moved to the relatively "safer" location of Guatemala City. But as history shows, the move would prove to be unwise since the eventual earthquakes in Guatemala City would actually outnumber the ones in Antigua. In fact, the 20th century alone included large-magnitude earthquakes in 1902, 1917, 1918, as well as a 7.5-magnitude quake in 1976 that killed an estimated 25,000 people. Today, visitors can view many of the incredible ruins that have been preserved, which makes it a type of open-air museum that offers a glimpse into the past. In addition to its historical significance, its spectacular surroundings include three volcanoes on its horizon: the 13,044–foot Acatenango, the 12,345–foot Fuego, and the almost surreal 12,356–foot Agua. Overall, it can be a busy city, but its relaxed atmosphere is what makes it special and the reason why so many expats now call it home. The city itself is incredibly accessible and most of the major sites are located within an eight-block area. Your only difficulty is to watch the traffic and your step, especially on the narrow sidewalks that can be in disrepair. Otherwise, use common sense and do not travel alone down unknown streets during the evening. If you do catch yourself out past dark, then make sure to take either a taxi or a tuk-tuk (moto-taxi), which can quickly take you from point A to point B. But make sure to negotiate your fare ahead of time because they can charge up to 100-percent more than they usually do just by looking at you or hearing a foreign accent. There are approximately a dozen historical sites within an eight-block area and all of them can be easily explored on foot. 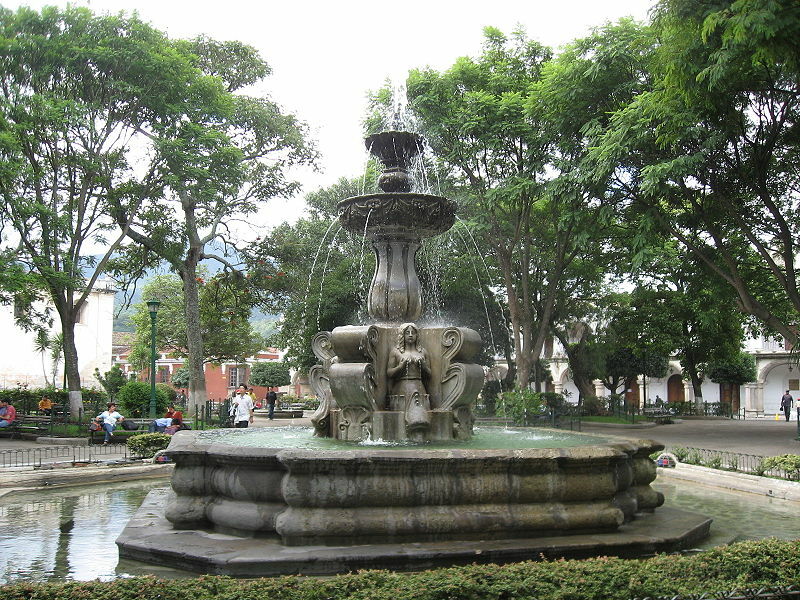 Parque Central: Like the majority of Spanish colonial cities in Central America, the tree-lined Parque Central is the focal point. This is where visitors and residents come to either meet people or relax on any of its benches near the Fuente de Las Sirenas, which was built in 1738. It is also the best starting point for exploring this historical section of the city. On weekends, you will also hear many mariachi bands serenading anyone willing to pay them. Catedral de Santiago: Again, like any Parque Central, you will always find one of the largest and most magnificent churches just steps away. Located on the eastern side of the Parque Central, this cathedral is more correctly known as the Parroquia de San José. It has been demolished and rebuilt so many times that there are conflicting dates of when it was first built. Some say 1542 while other say 1670. But what is agreed upon is the fact that there was once a large dome with at least 18 chapels and five aisles in its sanctuary. It even included a highly decorative altar lined with ivory and silver. Unfortunately, the 1773 earthquake destroyed most of the cathedral and only portions were rebuilt in the 19th century. For some perspective of its original size, stop by the ruins behind the church. When it gets dark, make sure to stop by to see the church because its facade is lit up with lights. Palacio de los Capitanes: Taking up the whole southern side of the Parque Central, this structure was built in 1543, which makes it one of the oldest in the city. Most of its two-level facade is original, but the remainder of the building was re-constructed in early 1900s. Also known as the Palace of the Captains-Generals, it has served in a wide array of roles that include the Latin American mint, government residences, the government’s courts and local offices as well as military barracks. Today, it serves as the local government office but visitors can stroll through the grounds during business hours. Church of San Francisco: Located at the corner of 7 Calle Oriente and 1 Avenida Sur, this is also one of the oldest churches in the city. Dating back to 1579, it once served as a religious and cultural center that included everything from a school and a hospital to a monastery. But it too was devastated by the 1773 earthquake. Very little of its original structure remains but the monastery’s ruins can still be seen. The church includes the tomb of Central America’s first saint: Hermano Pedro de Betancourt. He was a Franciscan monk who founded the Hospital of Belén that once offered miraculous healing powers on more than one occasion. 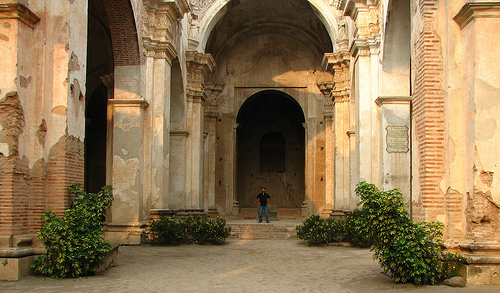 Las Capuchinas: These remains are one of the best preserved ruins in the city. Located on the corner of 2 Calle Oriente and 2 Avenida Norte, it was once the largest convent in the region that dates back to 1726. It includes everything from fountains and courtyards to interesting towers. After the earthquakes in 1751 and 1773, the sisters abandoned the building and it remained empty until 1813, when it was sold. It now serves as the home for the city’s council on historical preservation with a museum that features exhibits about the religious history of the city. Arch of Santa Catalina: As seen in the photo at the top of this post, no visit to the city is complete without viewing this magnificent arch that crosses 5 Avenida Norte. 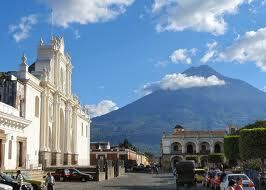 It is one of the most photographed locations in the city, mostly due to the Volcán Agua in its background. Built in 1609, the arch is all that remains of the original convent and nuns once used it to cross the busy street without being exposed to the outside world. La Merced: About one block north of the Santa Catalina arch, this church includes one of the most detailed facades in the country. Formally known as the Iglesia y Convento de Nuestra Señora de La Merced, it was built in 1694 but reconstructed in the 19th century. 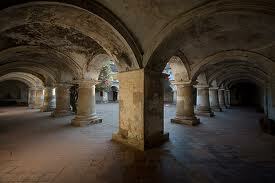 The church is still being used today and its grounds include beautiful cloisters, a grand fountain and gardens. If you can, try to go to the upper level, since there are some beautiful views from that vantage point. El Mercado:This large central market is located approximately three blocks west of the Parque Central. You will find a large maze of stalls with vendors offering everything from artwork and handcrafted furniture to fresh meat and flowers. To fully explore the site, you will need about a full day but it is always an experience to just walk through the market even for just a brief moment. Just be careful and hold on to your valuables because pickpockets are watching. The official market days are generally Mondays, Thursdays, and Saturdays. 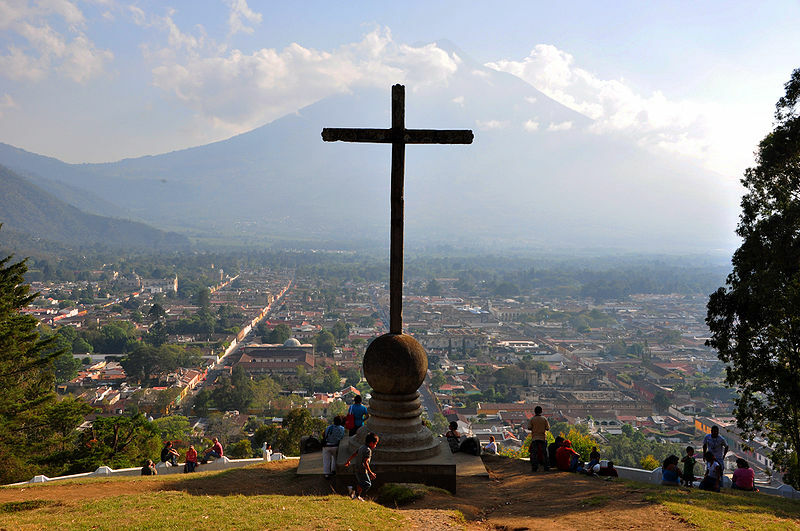 Cerro de la Cruz: Located northeast of the city is a hill that offers one of the best views of the area. It takes approximately 30 minutes on foot to get there from the Parque Central. Unfortunately, there have been so many cases of robberies on the trail, the Tourist Police now lead the hikes up to the park twice a day for free. Going at any other time is at your own risk. Reserve your spot on the tour at the Tourist Police Office, which is located on the northeastern corner of the Parque Central. For more information on how to get to Antigua, check out my post Traveling to the City of Antigua, Guatemala.